Heures mystiques: Entrees, Offertoires, Offertoire funebre. Composed by Leon Boellmann (1862-1897). Edited by Helga Schauerte-Maubouet. This edition: urtext edition. Paperback. Leon Boellmann. 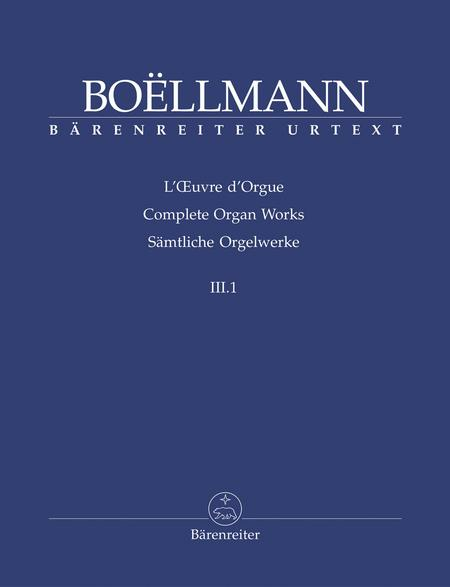 Complete Organ Works III,1 \| BARENREITER URTEXT. Performance score, anthology. Baerenreiter Verlag #BA08462. Published by Baerenreiter Verlag (BA.BA08462). ISBN 9790006521098. 30 x 23 cm inches. Leon Boellmann (1862-1897) studied at the Ecole Niedermeyer and served as titular organist at Saint-Vincent-de-Paul in Paris . Following in the tradition of Saint-Saens, Franck and Gigout , he wrote music reflecting the elegance and urbanity of the Belle Epoque. In 1896 he published a collection of one hundred short pieces for organ or harmonium entitled Heures mystiques. These pieces now form volume III of Helga Schauerte-Maubouet's practical Urtext edition. The collection is divided into three sub-volumes reflecting the numbering and arrangement of Boellmann's autograph fair copy. It offers organists a treasure-trove of easy pieces for use in church services. 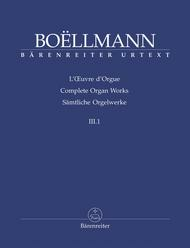 To play these pieces imaginatively on multi-manual organs, the performer must suitably adapt the musical text; the editor has provided an appendix with registrations for Offertoires I-II (op. 29, nos. 1-2) to serve as examples. In addition to a detailed preface and facsimiles, the edition includes a critical report in three languages and a list of sources.